"I found my art career in the garbage," says Serik Kulmeshkenov, from his cozy studio in northeast Rochester, nestled in a crook of Highway 63 North between a liquor store and a car dealership. He's an artist of international stature despite his modest claims for his beginnings, about which more later. His studio walls are hung with awards from competitions in Poland, England, Russia, the Czech Republic, and Japan. 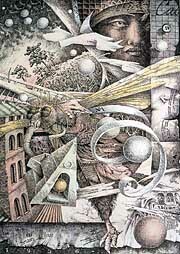 Serik's (pronounced sir-EEK) works fill an entire chapter in an encyclopedia of top international etchers and engravers, whose editors call Kulmeshkenov "an artist of kindly disposition well known to the general public" whose works revolve around "cosmic, historical, literary, and medical themes." His clean and classical style is whimsical and even surreal at times, mixing elements of the German master engraver Albrecht Durer, the Dutch visual illusionist M.C. Escher, and the droopy candy-cane trees and hats and highways of Dr. Seuss. "The craftsmanship is extraordinary," says B.J. Shigaki, the director of the Rochester Art Center. "There is a fine narrative about his work, a story-telling. It's drawn with great intimacy and detail. It's so rare these days, when everything's done on computer, to see the hand still involved." He's a cartoonist, too. Don Quixote figures prominently in his cartoons Ñ one shows the hapless Spanish knight demolishing pictures of windmills on a computer with a click of the mouse. He's drawn a series of cartoons illustrating American idioms, those brilliantly imagistic phrases, with drawings of people who are "going bananas," "have a screw loose," and are "telling white lies once in a blue moon." 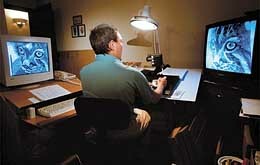 Serik Kulmeshkenov, legally blind, uses a computer imaging device to magnify his highly detailed artwork. And Serik Kulmeshkenov, 46, is legally blind. This cruel irony is closely tied to his claim to have found his career in the garbage. But to understand the linkage exactly, it's best to start from the beginning. A native of Kazakhstan, the central Asian republic best known for its vast oil reserves, Kulmeshkenov is the son of a railroad conductor. A slight, round-faced man, he had an artistic bent as a young man and so, after a two-year stint in the army, studied architecture. Upon graduation he went to work designing hospitals and school buildings at Kazakhstan's state-run Architectural Institute. And that, at age 26, is when his troubles began. 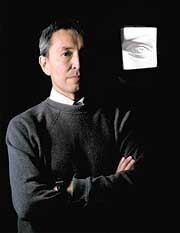 Serik Kulmeshkenov went blind. The diagnosis was Behcet's Disease, a rare and incurable illness that causes inflammation of blood vessels. In Serik's case, the disorder affected his eyes. A three-week regimen of steroids would restore his vision, after which he'd have ten days of sight, and then it was back to the hospital again. This went on for 12 years, during which time he lost his left eye completely and most of the sight in his right. He lost his job as an architect, his income, and he very nearly lost his life. "It seemed my future was destroyed," the artist says. "My soul, my inner space, was empty." This was the metaphorical pits, the "garbage" that Kulmeshkenov speaks of. But he means "garbage" quite literally, too. On one of his ten-day furloughs from the hospital, Kulmeshkenov was at his mother's house taking out the trash. A newspaper article in one pile caught his eye, just before the final toss. He fished it out and discovered it was about bookplates, a special style of engraving stamped "Ex Libris" ("From the Library of ..."), an art form that in its long history has attracted artists of technical virtuosity, thematic diversity, and who often incline towards an M.C. Escher-like fascination with making visual puzzles and puns. The bookplates fired Kulmeshkenov's brain. As the real world faded from his sight, he grabbed onto the vivid flashes the bookplates gave him of their magical world. Bookplate engravings often depict everyday objects rendered in such a way that they pulse with a strange energy, like ritual totems or religious icons -- smoking pipes, acorns, planets, nudes, snowy mountain peaks, waves and clouds like a girl's flowing hair. "It's a magical world," Kulmeshkenov says. He absorbed the images hungrily, knowing his sight would dim within days or hours or minutes. He started making engravings himself, self-taught, one by one. When he went blind again and back to the hospital for another round of steroids, his memories of the bookplate images focused his mind. "I would be in the hospital for three weeks and I would think, 'there is an engraving at home waiting for me to finish it.' During this time I was able, by writing to artists around the world, to make friends with them and to share my art. So you see I was very lucky. Sometimes when a disease like this happens a person will use alcohol or drugs to solve the problem. But through bookplate engravings I found my art and I was able to keep my soul quite fresh." Hard work brings luck, or so it's said, and it surely seemed providential when, after his dozen years of the grinding home and hospital routine, Kulmeshkenov won a visa to move to the United States in Russia's "green card lottery" of 1999. Knowing that Mayo Clinic doctors could treat his Behcet's Disease possibly better than anywhere on earth, it was to Rochester that he decamped. So now, Kulmeshkenov, his wife and his three children and his cat named Angelika, are Minnesotans for life. His Behcet's under control and with the help of a handheld magnifying glass and a closed-circuit TV drawing device, the artist is back at his table. The profusion of bookplates, engravings, etchings, and cartoons are starting to flow once again. Given the view from his studio window, perhaps he will one day render Andy's Liquor or Domaille's Buick-Mazda-Mitsubishi in some fantastic way. More likely he will be telling visual stories about our frozen winters, our governor, our fishing habits, our Norwegian bachelor farmers, our football teams. In sum, he'll be drawing pictures of our dreams. But not, this time, for the trash.